The SUPER HEALTH evaluates the effects of an exercise program on improving pain, fatigue, physical activity, and physical function. The exercise program will be delivered through a tablet app in the convenience of your home using exercise videos. You will be randomly assigned in either the 1) exercise group, 2) exercise with a social networking group or 3) control group. The program will be adapted to your specific needs and abilities. If you have difficulty walking as a means for exercise, you may be eligible. Participants receive study equipment valued up to $500. For more information or to participate, email Jennifer Howell or call 205-403-5509. 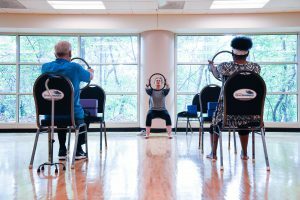 The M2M study tests the effects of a 12-week rhythmic-based Movement-2-Music exercise program on health and fitness outcomes in people with neurological disabilities. People who enter the study will be asked to participate in either the 12-week M2M program or a waitlist control group. This study is for adults between the ages of 18 and 70, who have a diagnosis of health injury, stroke, multiple sclerosis, spinal cord injury, Spina Bifida, Parkinson disease or cerebral palsy. Participants can be compensated up to $255 for completing the study. For more information or to participate, email Alex Yates or call 205-403-5525. 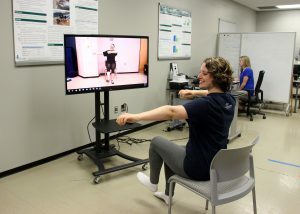 The TEAMS study compares the effects of a blended complementary alternative medicine (CAM) intervention consisting of neurorehabilitative exercise, Yoga, and Pilates between people with multiple sclerosis receiving the same treatment onsite (DirectCAM) versus at home (TeleCAM). 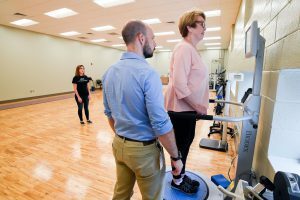 This study will evaluate the effects of the two forms on improving pain, fatigue, physical activity, and quality of life. People who enter the study will be randomly selected to participate in the 12-week CAM program either at the clinic (DirectCAM) or at home using a telehealth platform (TeleCAM). This study plans to enroll 820 participants in Alabama, Mississippi, and Tennessee, between the ages of 18-70. The study is planned to last 1 year and you will complete regular assessments at the closest participating clinic. Participants will be compensated up to $140 and given all the necessary exercise equipment valued at up to $380. For more information or to participate, email Emily Pounds or call 205-403-5512.